The Clark County School District and Nevada System of Higher Education are hoping to address the 704 teacher vacancies in Clark County and the more than 1,000 statewide by expanding the Rebel Teach Program. LAS VEGAS (KTNV) — The Clark County School District and Nevada System of Higher Education are hoping to address the 704 teacher vacancies in Clark County and the more than 1,000 statewide by expanding the Rebel Teach Program. 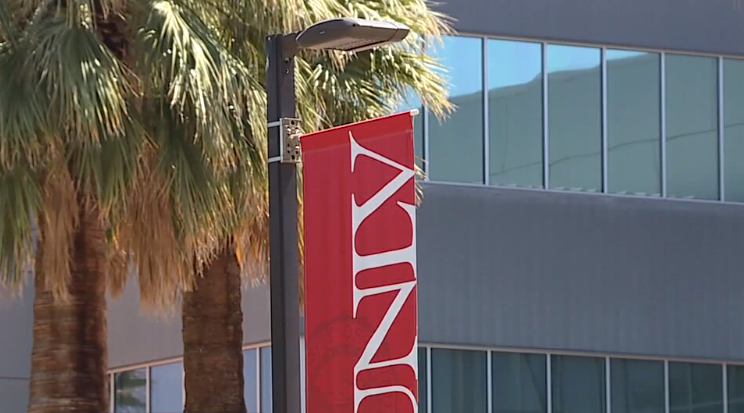 "We are graduating teachers quicker if they are able to take these courses," Danica Hays, Executive Associate Dean in UNLV's College of Education said. The Nevada Teacher Workforce Report shows the state is making progress when it comes to teacher vacancies showing the overall number of vacancies is down about 25 percent from the 2016-2017 school year. The report written for the Nevada Consortium on the Teacher Pipeline pointing out the teacher shortage is something a majority of states are dealing with, with most struggling to find qualified teachers in special education, math and science. Although CCSD and other Nevada districts are trending in the right direction the Rebel Teach Program could help fill that pipeline faster, as proven by the programs already in place at Northwest Career and Technical Academy and Clark High School. "We are graduating teachers quicker if they are able to take these courses," Hays said. "It allows them to get credit for the high school courses while they are getting high school credit and it gets them oriented to the teaching profession." As CCSD works with to expand the dual credit programs to better prepare high school students for a college or a career, the teacher training program is among those looking to expand. CCSD's Board of Trustees recently approving a memorandum of understanding that will allow the UNLV program to expand to any high school. "How do we expand our teacher academy, so we can start developing and creating, building teachers in our own high schools that want to go into education," Superintendent Jesus Jara said. The partnership not adding costs to the college or high schools. The program uses existing syllabi to introduce high school juniors and seniors to four courses: diversity in education, introduction to elementary and secondary education, technology and introduction to special education. "Over two years they get a nice broad range of courses that introduce them to different specialties," Hays said. And those courses are taught by selected teachers on the high school campuses who work closely with the UNLV faculty with the same high school teachers not getting extra pay but professional growth. "We are able to engage more with the teachers and I think it can serve as a way to retain more high-quality teachers as well," Hays said. The professional development can provide that boost to keep current teachers on the job. This as reports show 20 percent of Nevada teachers left the profession between 2012 and 2017. It is providing the boost for teachers as well as getting their students excited about the profession offering a potential double benefit for CCSD. "It is really just a way for us to collaborate to address some of the biggest challenges we have," Jara said. Another benefit to the UNLV program is the students enrolled are essentially job shadowing while learning. "I think what is unique about the Rebel TEACH program is they are taking classes in high school from these teachers, but they are also learning how to teach from these teachers," Hays said. With the program giving hope that CCSD, UNLV and the Nevada System of Higher Education can work together to fill the teacher pipeline for years to come. "We are very excited about the possibility of expanding to every high school in the district if they are interested," Hays said. For students interested, the college credits earned in high school are transferable to any college under the NSHE umbrella. The program has been approved for expansion; it is unclear how many schools will welcome the agenda for the 2019-2020 school year. It is best for students to check with their school counselor.